"The bhaktas, they have no demand, and therefore they are happy. They have no demand. Although the bhaktas are meant for going back to home, back to Godhead, but they don't care for it. 'Whether I shall go back to home, back to Godhead, it doesn't matter. I must serve Kṛṣṇa, that's all.' That is bhakta. Anyābhilāṣitā-śūnyam: no other desire. They want to see Kṛṣṇa happy, that's all. If Kṛṣṇa is happy, they are happy, bās. They remain in the hell, it doesn't matter. Nārāyaṇa-paraḥ sarve na kutaścana bibhyati. Those who are devotees, they are not afraid of going to hell. They are prepared going to hell: 'All right, I shall go to hell and chant Hare Kṛṣṇa. That's all. Finished. 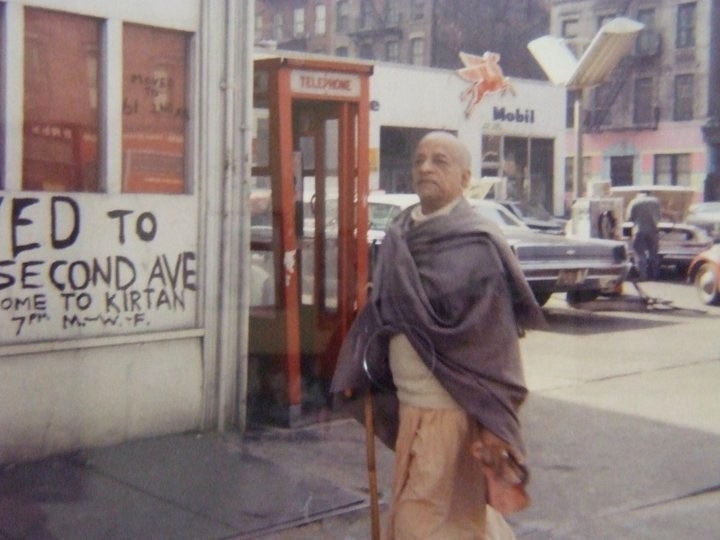 I want to chant Hare Kṛṣṇa. So I can do it anywhere. I can do it in this corner. I can do in this building. I can do it in the aeroplane. I can do it in the hell. I can do it India. I can do it in Los Angeles, anywhere. It doesn't matter what I am or what is my position. I may simply go on chanting. That's all.' This is devotee. Therefore he's happy."